Secret Santa is a festive card game of proving to friends and family that you're a better person than they are. At Christmas, it's important to remember that it's better to give gifts than to receive them. But what's better than that, is to be the best. Be the first to give away every gift you've got to win the round. Mix things up with Santa's Elves, give away all of your Gold Rings, and try not to get stuck with the Fruitcake. 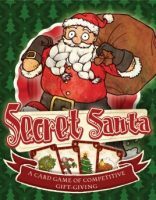 Add a Review for "Secret Santa"